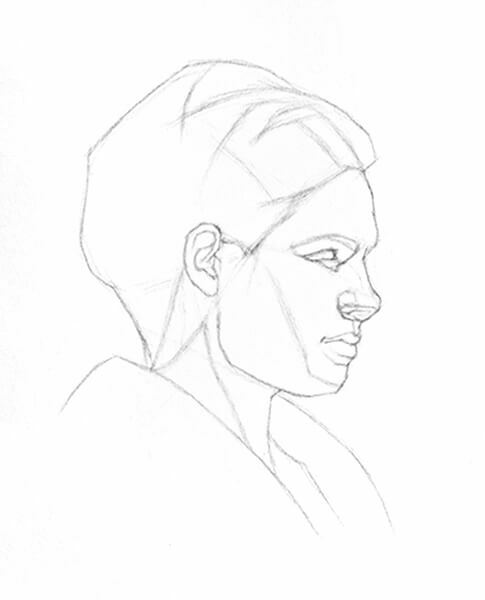 This first page of the portrait drawing tutorial is all about drawing your block-in. 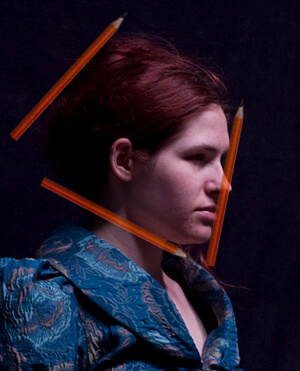 The block-in is a map of the various information that you need to complete your portrait drawing. It addresses proportions, placement and construction of the head and features, shadow shapes, and even edge quality. 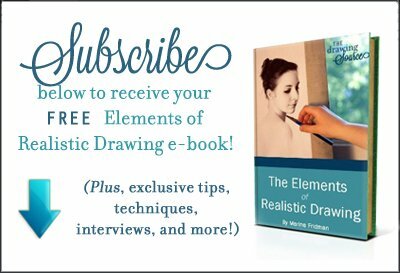 The block-in is easily the most important part of this portrait drawing tutorial. Step one! 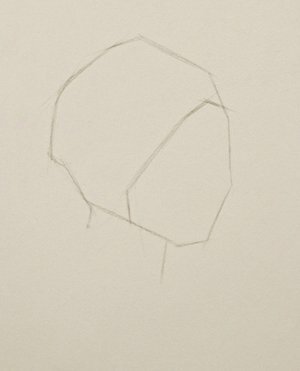 Decide how large you want your drawing to be on your paper.  Jot down a measurement that will indicate the size of the drawing, such as the height, as I have done here. As always, you want to work "general to specific". This means that you start with the largest, most general measurements (such as the height and width), and then move to incrementally smaller measurements until you get to the smallest, most specific ones. 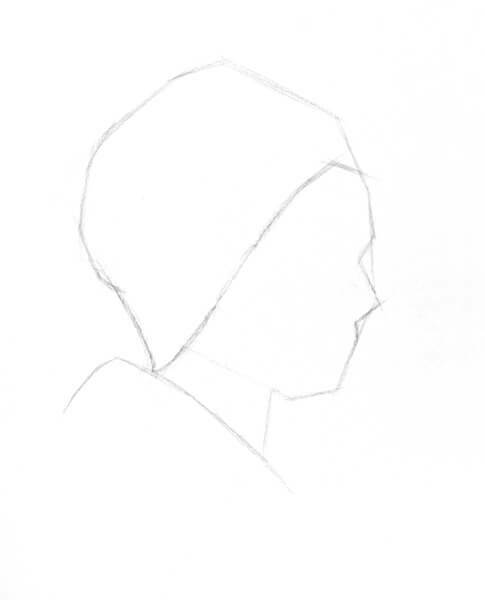 To figure out the width of the head, I measure the height with my pencil, from the chin to the top of the head, and then compare it to the width. I notice that the width is slightly narrower than the height, and indicate this on my drawing. 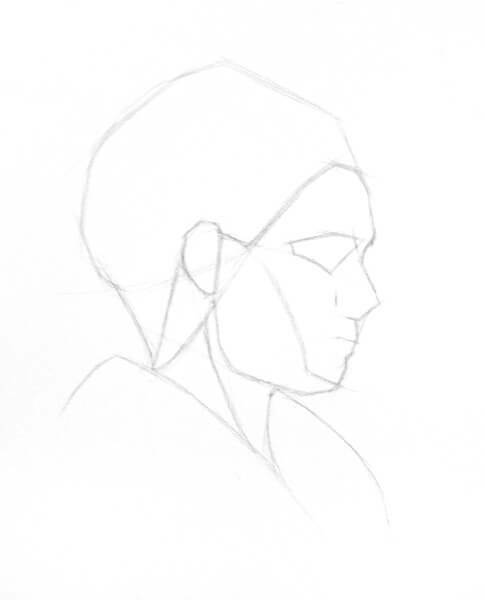 I begin to map out the general shape of the head. I draw with light, straight lines so that they are easy to erase and edit. There aren't many truly straight lines when drawing something organic (like a person!). Everywhere you look, you get some degree of curvature. However, creating the angles of the head with straight lines as opposed to curved ones will result in a more accurate drawing later on. 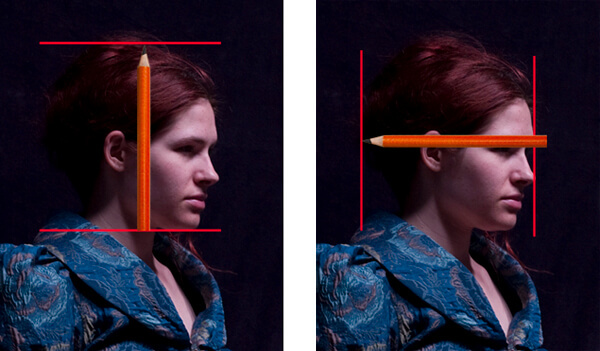 To help yourself visualise straight lines, extend your pencil in front of you to see the angles of the head more clearly. 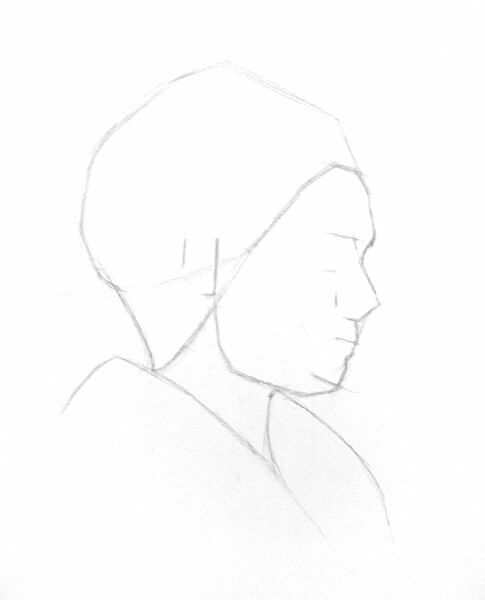 I begin to refine the contour of the head by breaking up the angles into smaller, more accurate segments. 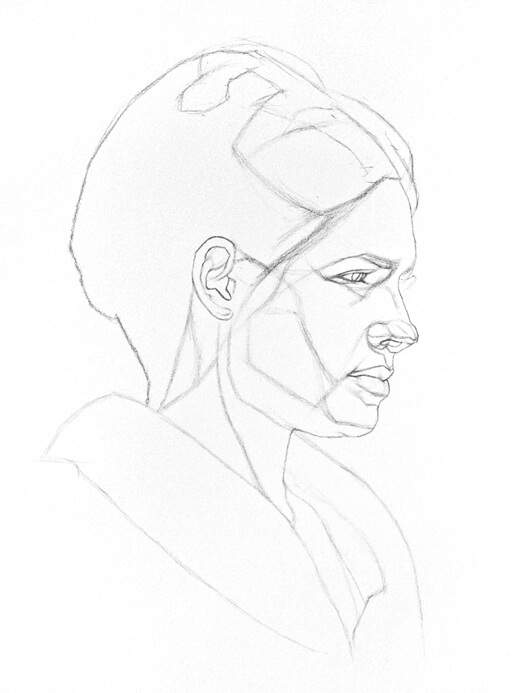 Something I want to emphasize in this portrait drawing tutorial is to look for lines that flow into one another. 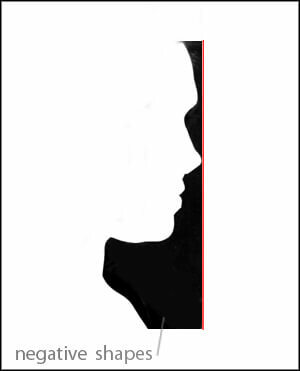 For example: the hairline flows right into the line of the shadow being cast onto the neck. When connected, these lines create a beautiful S-curve. The more elements you can relate to each other on the face (such as these two lines), the more accurate and organic-looking your block-in will be. At the end of this article, download a free infographic version of this page! As you begin drawing the contour of the profile, imagine straight lines from which you can measure certain points on the face. For example: I can imagine a vertical line originating at the front of the model's chin. 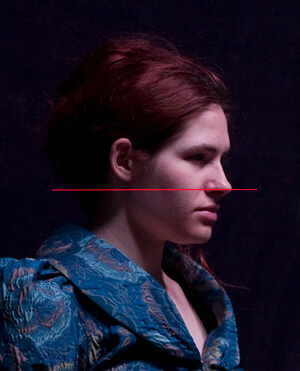 This helps me see how far the lips, nose, and forehead extend to the right of the line. I can also imagine a straight vertical line at the tip of the nose. This clearly shows me that the forehead almost reaches the line, but not quite. The nose extends to the right ever so slightly more than the forehead. Now I know where to draw the forehead in relation to the nose! You can create these imaginary straight lines anywhere, and use them in any way that they are helpful to you. Continuing the block-in for this portrait drawing tutorial! I now approximately place the ear and the features of the face. "Features of the face" refer to the eyes, nose and mouth. How did I place the ear? Since I have already found the approximate location of the nose, I imagine a horizontal line through the tip of nose, and look to see how far above this line to place the ear. I continue blocking in the large shapes of the face. During this part of the block-in, I greatly rely on rhythms to help me place and connect all the elements of my drawing. Rhythms are curved lines that flow from one element of a picture to another, creating a kind of underlying structure that connects all the elements in the image. Read more about rhythms and how to use them here (coming soon)! 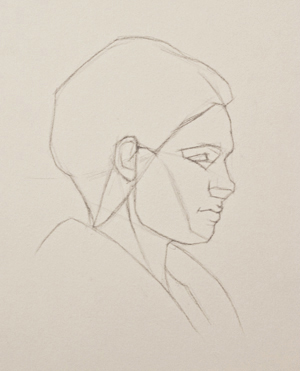 To refine the contour of the face, I again rely on the measuring lines I used earlier. Remember the vertical line that I imagined at the tip of the nose? Look at the shapes created between that line and the contour of the face.  These are called negative shapes. "Negative" refers to the space where there is no form. 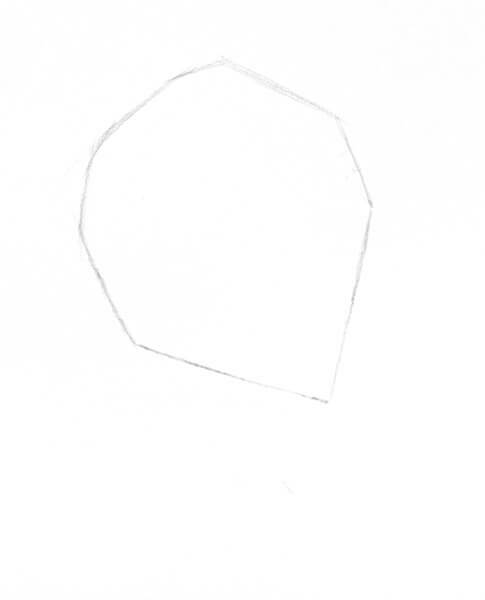 So, naturally, the "positive" shape would be the shape of the actual form (the face). Negative shapes are extremely useful in refining the contour of the face! As you draw, try to forget that you are drawing a face. Forget that you are drawing a forehead, a nose, lips and a chin. Instead, look at the negative spaces as abstract shapes, and draw them as such! This slight change in perspective may not seem like much, but it often results in a more accurate drawing. Use straight lines to block in the profile of the face, just as you did when you were blocking in the large angles of the head. The straight lines help you clearly indicate the high points (the most protruding points) on the profile. Once I am confident in the placement of the features, I begin constructing them anatomically. This stage of constructing the features is a combination of what you see and what you know. You often can't see the construction of the features clearly, so you have to have an understanding of what is there in order to construct it accurately. Or perhaps the model has very soft angles that hide elements of the construction of the face. In all of these cases, it's important to have an understanding of head and feature construction so that you can fill in these visual gaps. Voila! Here is my completed block-in for this portrait drawing tutorial. I have constructed the features, drawn in the shadow shapes, and indicated some of the differences in edge quality. I have also left some of the flowing rhythm lines, because they remind me that every element in my picture relates to something else, and that nothing exists in isolation. 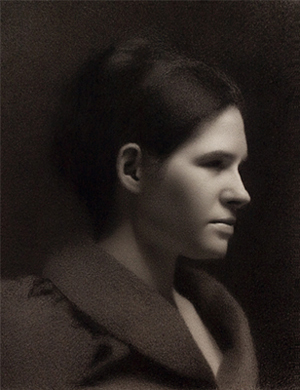 If I keep this in mind as I render the portrait, I am more likely to create an organic-feeling, unified picture.